Once you’ve decided WHAT to do to improve your home’s energy efficiency, you face the challenge of finding WHO can do the work. Fortunately, Efficiency Maine has made that second step easy—by offering an online “Find a Vendor” search tool: www.efficiencymaine.com/at-home/vendor-locator/. This page of the Efficiency Maine website gets a lot of traffic—as homeowners use it to locate a wide range of energy efficiency contractors, from companies doing energy audits to those installing heat pumps or heat pump water heaters. Close to 800 companies have registered statewide. The Vendor Locator page offers an introductory video but using the search tool is straightforward. Simply type in your ZIP code and preferred geographic radius and then click on the services that you need (e.g., insulation or pellet/wood stoves). You can sort the results by the number of projects the contractors have completed, by the distance from your location, or by company name. You’ll get a list with contact information for firms—with symbols denoting which of the needed services they provide. Many of vendors serve a wide geographic area. For one-time installations that require little maintenance (like insulation), the distance of the contractor from your location may be less important. For heating systems that need annual or bi-annual tune-ups, though, you may want to select a vendor closer by who can more readily perform that service. 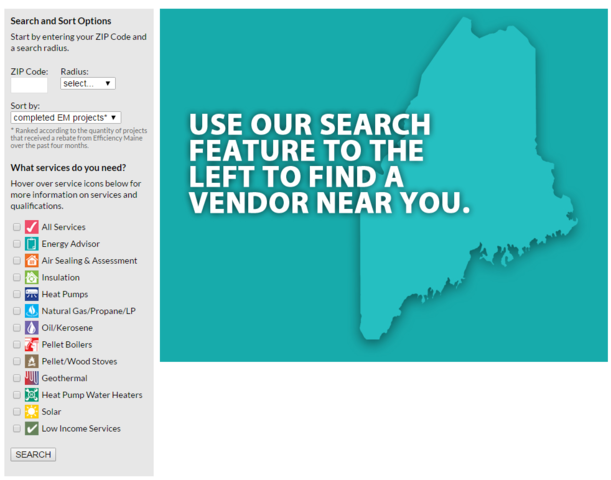 The Vendor Locator page has a link to a list of questions prepared by Efficiency Maine staff on “How to Select a Registered Vendor.” As a consumer, you’ll want to choose a contractor only after due diligence. The firms listed on the “Find a Vendor” webpage complete a registration that includes providing industry licenses, but they are not endorsed. So ask questions, obtain price quotes, call references, and get a contract before starting major projects. You’ll also find a lot of background information on many energy efficiency projects on the Efficiency Maine website.